My husband and I were in need of a new bed because the one we were using was just too high. Our dog couldn’t make it on top of it (yes, we allow our dog on the bed) and when he jumped off the other day he hurt his leg. (No thank you to vet bills) More importantly my daughter thinks it’s funny to dance on top of our bed, until she tumbled off the side of it the other day, not funny anymore. Both were finally cause for the bed shopping to begin. I wasn’t opposed because the bed we originally received as a wedding gift was no longer our style anymore. It was also just too large for our new house. Let the shopping begin. We were looking for a white, modern, clean lined bed that was low. We all know though that budget is always a factor over here so that is where the splurge vs. thrifty comes in. I think these two beds are such a great match for each other. 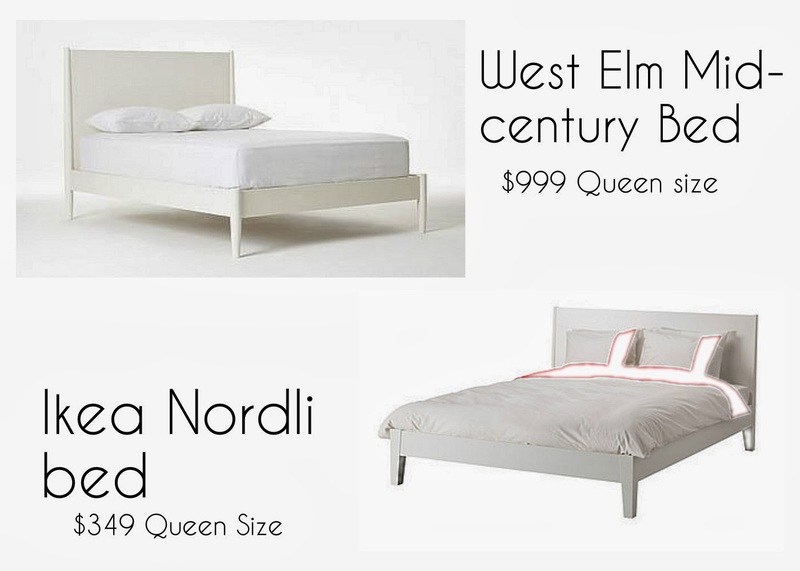 We ended up with the Ikea Nordli bed as it was a much better fit into the budget. We are absolutely loving it with the look of our master bedroom. This room isn’t complete yet, but this just moved me one step closer. As soon as I get the rest of the room done I will be sure to share a bunch of photos. For now, here is one I shared on Instagram…my doggie really loves the new bed!